Home » Courtney Post, Au.D. Courtney Post joined Fayetteville Otolaryngology Head and Neck Surgery, P.A. as a Doctor of Audiology (Au.D.) in June of 2018. In 2014, Courtney earned her Bachelor’s degree in Speech Pathology & Audiology from Calvin College (Grand Rapids, MI). She went on to complete the Doctor of Audiology program at East Carolina University (Greenville, NC); she earned her Au.D. degree in May 2018. 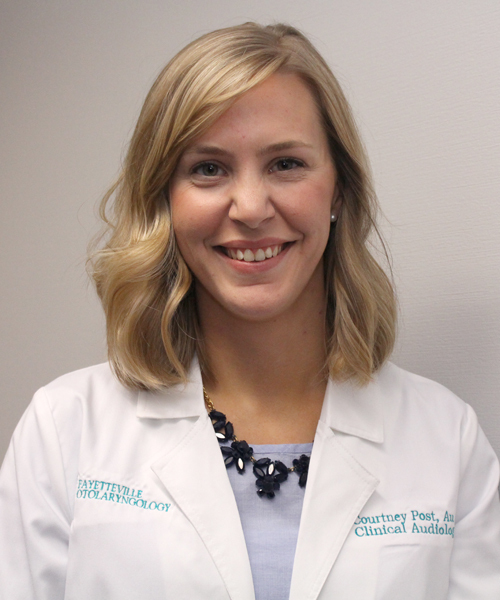 While in her doctoral program, Courtney completed pediatric- and adult-focused clinical rotations in the public school system, a private ENT practice, and two different VA hospitals. Courtney holds a license to practice in the state of North Carolina. Her professional interests include aural rehabilitation across the lifespan, as well as assessment of vestibular pathologies. Her interests include spending spare time hiking and mountain biking with her husband, playing with her sweet miniature goldendoodle, and visiting family and friends.